DIARY OF A PUBLIC SCHOOL TEACHER! : "Cause I Ain't Got No Pencil" - Why We Shouldn't Sweat the Little Things! 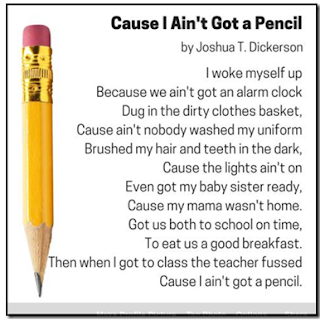 "Cause I Ain't Got No Pencil" - Why We Shouldn't Sweat the Little Things! I read the background story of Mr.Dickerson, the author of this poem, and it made me want to cry. The teacher made the student give her his shoe as collateral for a pencil. He had on dirty socks and all the kids started laughing at him. I've done it, not the shoe part. Never collateral. But I have shaken my head and said things like, "Why don't you ever have a pencil?" I don't even pay for my pencils, my district does. So why did I feel the need to address it? I should have just given the kid the pencil. After I read this poem a few years ago, I became more aware of my attitude towards my students regarding circumstances like these. It's similar to the wake-up call I got years and years ago when I used to fuss, roll my eyes, or make comments regarding the late ELEMENTARY student. They don't drive! How are they going to control what time they get to school or IF they get to school? Now I just smile and say, "I am glad you are here." with absolutely no sarcasm. It makes a difference. Do you know that educator that picks and picks and picks? Yeah, you know who I'm talking about. They have to make a case about every little thing. I remember I used to fuss at a little girl who never had her HW done. (That's when HW used to be an issue for me.) I found out at the end of the year that the little girl was homeless and staying in a shelter. I don't think HW was high on her list of priorities. In the article, Mr.Dickerson wants us to pay attention to what happened before this student came to school with no pencil. Pay attention to what the student did in order to come to school! That is what is important, how this child overcame their morning hardships and made it to school WITH their baby sister. And here we are, worrying about a pencil. Give the kid the pencil! Stop sweating the little things.